Ok, I'll admit-I actually do kind of like Fall & Winter, if only for the decorating, DIY and craft possibilities! As a kid, I carved a pumpkin pretty much every October. The adult part of me still wants to roast the seeds, but I want my pumpkins to look prettier. I've rounded up some of my favorite carved & no carve pumpkin ideas. 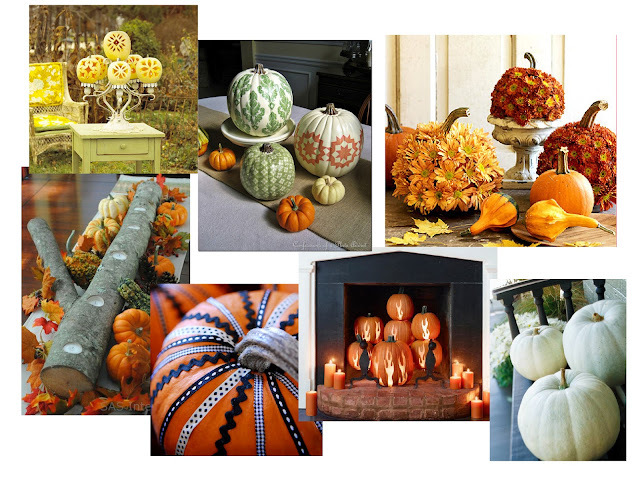 Lattice-carved pumpkins, Flower pumpkins, Ribbon pumpkins & white pumpkins, all via Better Homes & Gardens. Other pumpkins via Pinterest. There are so many cute, easy ways to dress up a pumpkin, from ribbons to glitter to leaves to flowers. Don't forget to make use of the pumpkin insides, either! My favorite thing to do is roast the seeds-this year I plan on roasted the insides, as well, so I have my own fresh pumpkin puree to use in all kinds of goodies. I love everything about this post! I've been Pinning away for pumpkin decorating plans. I'm thinking I'll buy a pumpkin this upcoming weekend. I've never baked my own pumpkin seeds before, but you've most certainly sparked my interest! It's super easy to do, and so yummy! Sometimes I just sea salt them, and sometimes I'll go for the cinnamon and sugar. I have friends who make them spicy but that's not my style.